When I post the Mystery Photo for you to guess at I sometimes already know who/where it is. I seem to remember a golf shop in Trafalgar Street, but I thought it was on the south side. This shop looks as if it would have been on the north side, as the slope is from east up to the west. 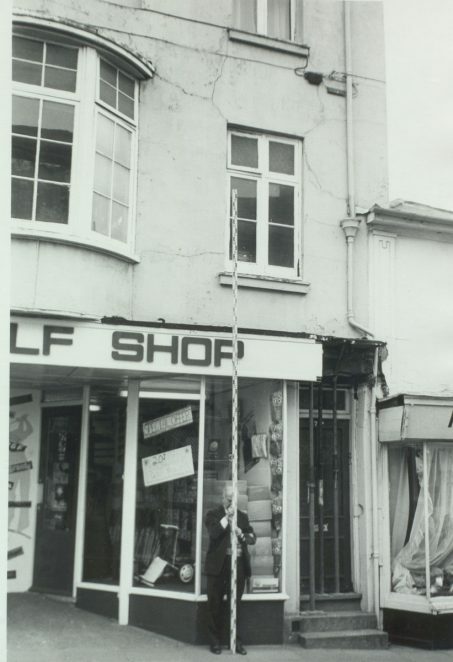 It appears that ‘The Golf Shop’ was in a condition of collapse judging by the Acrowprops in the doorway to the right. Your ‘guy’ is holding some sort of surveying pole being used in connection with another ‘guy’ using a theodolite on the other side of the street possibly in order to determine the amount of movement in the building. As to exactly where, I have no idea. Yes Alan, The Golf Shop was at No 79 Trafalgar Street according to 1976 Yellow Pages. No 79 is on the North side so the slope would be going in the correct direction down the hill towards St Peter’s Church. It was still there in 1981 but not for much longer as the site is now occupied by a much more modern building of circa 1980s design. I think I preferred the original shop!